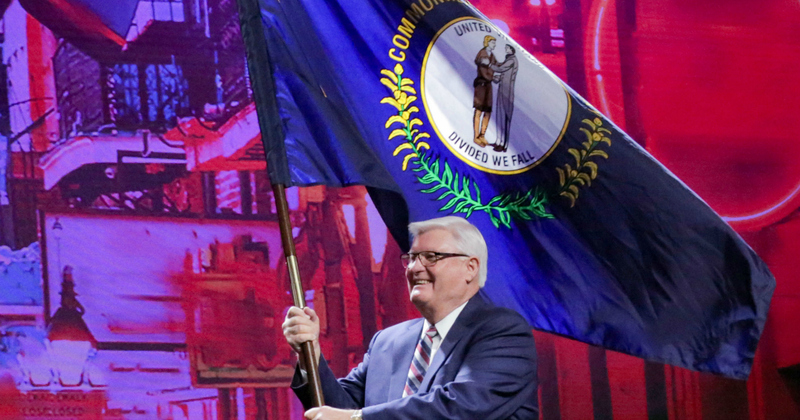 Kentucky Farm Bureau took home several organizational awards presented at this year’s American Farm Bureau Federation’s (AFBF) Centennial Convention. Each year state Farm Bureaus are presented awards in different categories related to several programs and initiatives. KFB President Mark Haney on stage during the opening session of the 100th American Farm Bureau Federation at Annual Convention in New Orleans, LA. KFB was honored with AFBF Awards of Excellence in all four categories given, including: Advocacy; Engagement and Outreach; Leadership and Business Development; and Membership Value. Haney, who led the Kentucky member delegation to the convention, accepted the awards on behalf of KFB which were presented by AFBF President Zippy Duvall. Kentucky Farm Bureau, with nearly 500,000 member families statewide, is the state’s largest general farm organization. Over 500 members from Kentucky attended the 100th Annual Convention of the American Farm Bureau Federation, held January 11-15 in New Orleans, LA to recognize this year’s individual and organizational achievements and adopt policy for 2019.